Raoul and Dr. Gonzo go to the Beverly Hills office of the sporting magazine to pick up 300 dollars for their trip. This scene is omitted and they just have money. When Raoul tells Dr. Gonzo they are going to the Mint 400 and it is a motorcycle race they discuss getting a motorcycle for the job. Raoul suggests a Vincent Black Shadow. They talk about getting a motorcycle, but fail to mention the Vincent Black Shadow. They leave the bar and discuss the Mint 400. As they leave the bar after getting the assignment, the Dwarf chases after them because they have skipped out on the bill. They get in Raoul's pinto and pull away. There is a man dressed as an angel holding a flaming sword. The pair locate a store that will sell them the special radio equipment. They are delayed when a sting ray killed a pedestrian. They arrive and complete the transaction through a slit in the door. They are told to go away, and Dr. Gonzo threatens them with violence. They are delayed attempting to get the radio when the stingray kills the pedestrian. The transaction at the store is not shown. While renting the car the rental agency man is questioning if they have been drinking. Raoul says he isn't. 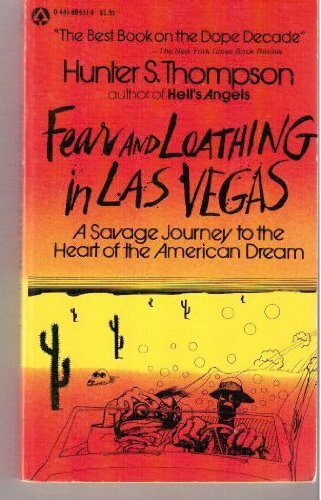 Dr. Gonzo snaps and tells him to fill the gas tank because they are in a hurry to get to Las Vegas. The rental agency man says "What?" and Raoul says never mind and races off into traffic. The two discuss the man's mental state. The rental agency man questions if they have been drinking. They ignore him and drive off.